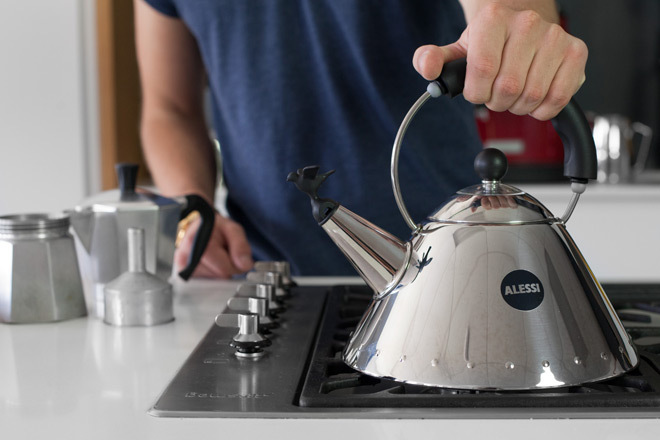 The Bialetti Moka Express lives in nine out of ten Italian homes, the Museum of Modern Art and the Guinness Book of Records. Many of us love this coffee maker, not only for the quality brew but because it allows us to partake in an Italian coffee making custom that has stood the test of time. 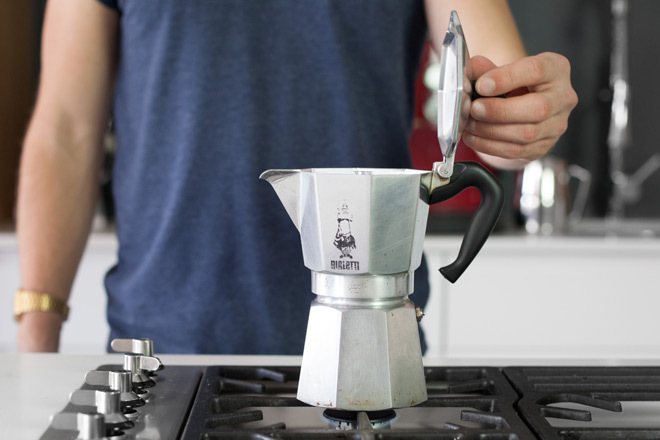 Here are some recommended steps to make sure you get the most from your moka pot, every morning. 1. Preheat the water. Stop your kettle just before the water boils. Starting out with hot water allows the extraction to take place more quickly and prevents the pot overheating, which can scald the coffee grounds. If you are using an electric stovetop, now is the time to turn it on to a medium heat. 2. Grind your coffee. Typically the grind should be slightly coarser than espresso but finer than that for a French press. If your grind is too fine it will result in over extraction and bitter coffee. Try a few different grind settings until you find the brew that works for you. Experimentation is key here; flavour is a spectrum so tinker around until you find one that pleases you. The 4.5 setting on the Krups Burr Coffee Grinder works for us. If you are buying ready-ground coffee, the finer consistency coffee for stove top coffee making is ideal. 3. Pour the hot water into the bottom pot; always fill it up to the bottom of the safety valve, regardless of the number of cups you intend to make. Spare a drop for the bottom of your cup too, warm cups really make a big difference to a good coffee experience. 4. 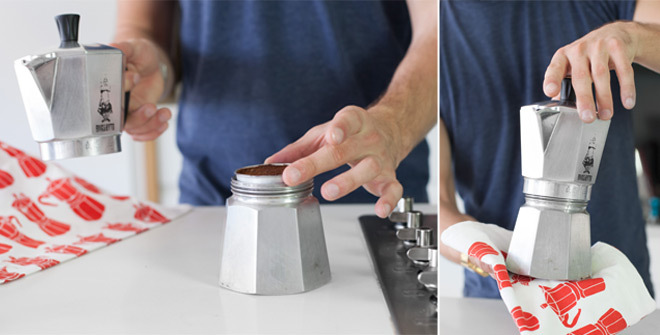 Fill the basket with a mound of coffee, then flatten it with your finger. It is not necessary to tamp it into the base of the basket, the grounds should be loosely packed. The extraction is fuelled by pressure created by evaporation in the lower pot and compressing the grounds will lead to an over-extracted, bitter brew. 5. Place the basket, filled and flattened, into the lower pot. Filling the basket with coffee before you do so prevents coffee grounds from littering the thread. Screw the top on using an oven glove or a cloth as the base will be hot. 6. Place it onto the stove. Leave the lid open throughout the process to prevent the chamber from overheating. A moderate heat will do the trick. You don’t want to boil the water in the pot but rather to create a gradual, controlled extraction. 7. Watch for the first splutter of coffee. If you’ve done it correctly the coffee should trickle out like a thick, golden-brown syrup. As the extraction continues it will become lighter and thinner. Remove it from the heat when the espresso starts to run pale. Have a cold, damp cloth at the ready to cool the base down immediately. This brings extraction to a halt and prevents the coffee from tasting burnt. The longer the extraction runs for, the more bitter your coffee is going to taste. The aim is not to wait for all the water to pass through the pot but rather to finish with a small amount of concentrated, quality coffee. The coffee produced by a moka pot is not quite as intense as that of an espresso machine but definitely more so than a plunger or filter pot. 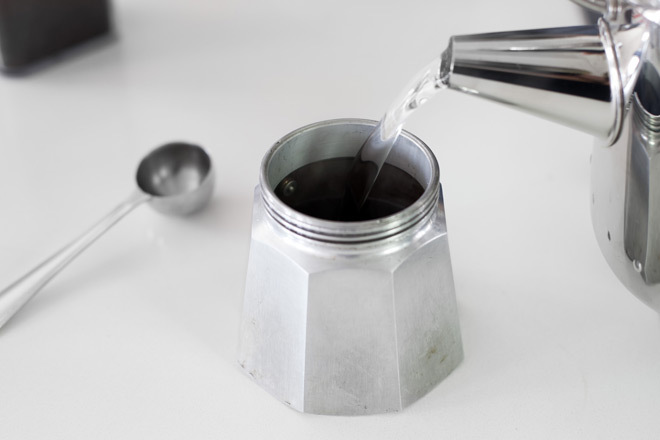 If you have enough coffee for more than one cup, pour it out of the moka pot into a thermal flask to prevent the coffee tasting harsh and giving it a bitter, metallic edge. 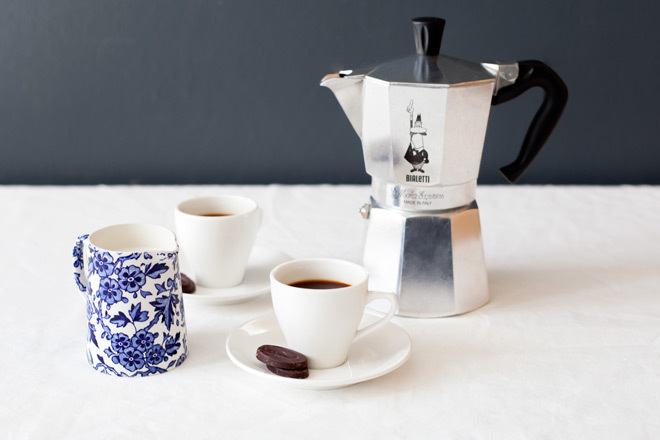 Got any additional tips or questions on making coffee with your moka pot? Share them on our Forum . 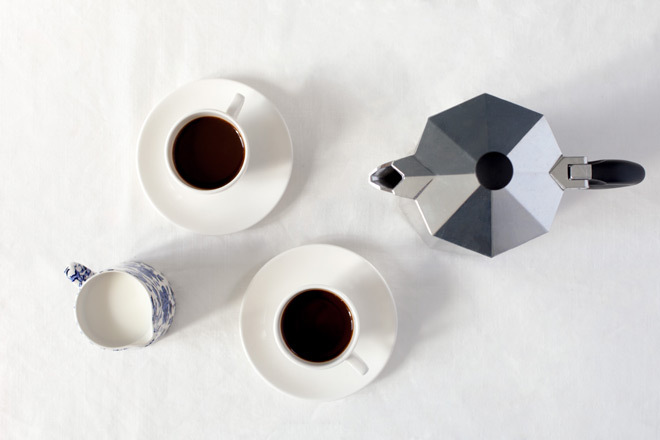 Browse our range of moka pots on Yuppiechef.